There is rarely a Formula One car quite so dominant as the Mercedes-Benz F1 W07 Hybrid. The car above, chassis number 4, is the most successful individual chassis in F1 history, having won ten Grands Prix with Lewis Hamilton at the tiller across the 2016 season. From 21 races that season, Hamilton and teammate Nico Rosberg won 19 of them with Rosberg ultimately taking the title. This mega piece of racing history is heading to the Sonoma Speed Festival on the first weekend of June with the track record in its sights. There is no word yet as to who may be driving the historically significant car, but the current Sonoma lap record is a 1:15.520. That time was set by Josef Newgarden in qualifying for the 2017 IndyCar Grand Prix of Sonoma. As we’ve already seen, IndyCar is a good bit slower than modern F1 racers on the same track, so I wouldn’t expect Newgarden’s track record to stand past the June vintage race event. The Mercedes-AMG Petronas Motorsport team chief mechanic, Matt Deane, will be flying directly from the Monaco Grand Prix to oversee the car’s operation at Sonoma. 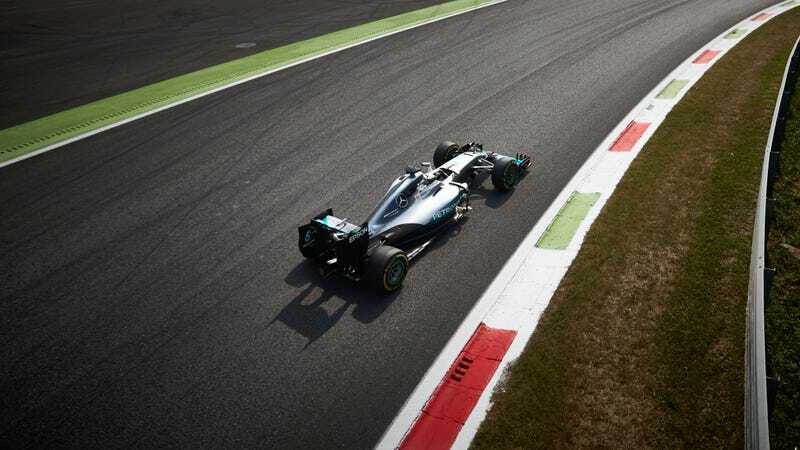 The Mercedes-Benz W07 Hybrid produces somewhere above 900 horsepower, and weighs just 1547.6 pounds. It should move quite quickly at the northern California track. I’m looking forward to seeing the record run, it’s been a while since I’ve seen a modern F1 car run at all!